Pimps is the old term for small bundles of sticks used for fire lighting. 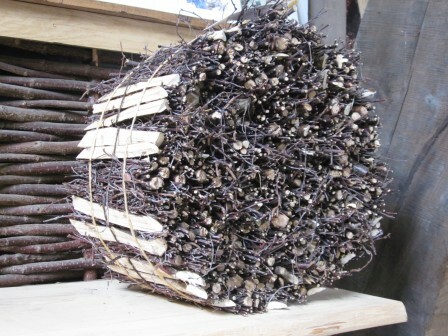 Birch twigs are an excellent wood for fire lighting. The twigs are trimmed and strongly secured together in a vice and tied using tar string. 25 small bundles are held together in a larger vice and secured using string or twine. Both the small individual bundles and the collective bundles are called pimps. As well as making the very best fire lighters they are attractive fire place ornaments.